Its a long time since I posted any chicken recipes and I realized this only when one of my Facebook friends enquired about it. 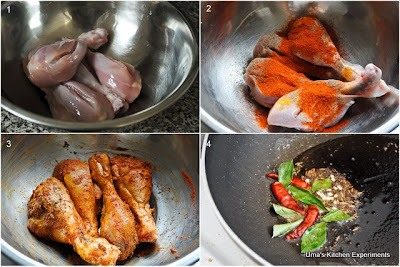 Looked quickly in my repository and found dry chicken drumsticks fry recipe which I haven't posted until now. Immediately I wrote a recipe for this dish and you are seeing it here. It tastes as good as fried chicken drumsticks. I prepare this at home often for my hubby instead of the deep fried one. You can try the same recipe with the boneless chicken pieces too. 1) Wash and peel the skin of the chicken drumsticks. Using a sharp knife to make slits on the surface. 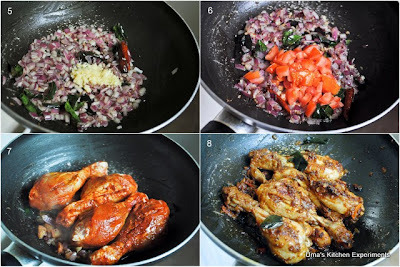 2) Mix all the ingredients given under marinade. 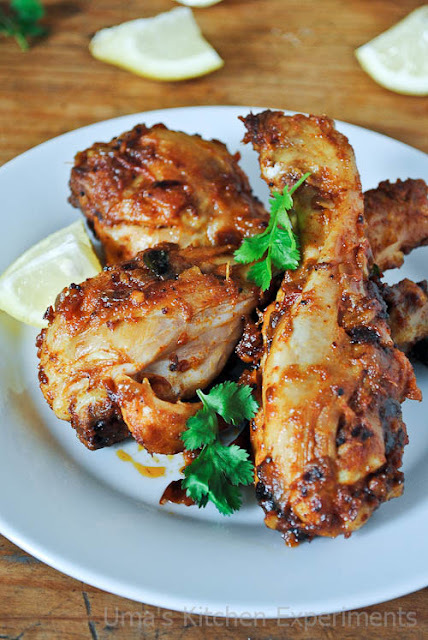 Make sure to coat the masala well on all sides of the chicken drumsticks. 3) Keep this mixture aside or keep it inside the refrigerator for a minimum of 30 minutes. 4) Heat 3 tablespoons of oil in a frying pan. 5) Add mustard seeds, cumin seeds, dry red chillies and curry leaves to it. Let it splutter. 6) Add onion and fry till it becomes soft. 7) Add ginger garlic paste. Fry till the raw smell disappears. 8) Add tomato and cook it until it becomes very soft and well cooked. 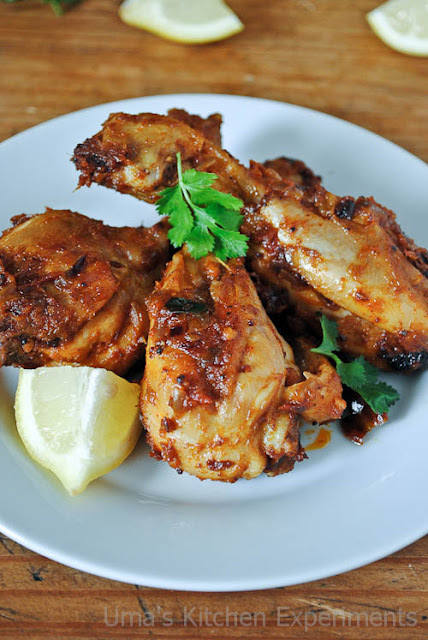 9) Add chicken drumsticks along with the juice left in the bowl. 10) Stir well and cover it. Cook for 7-10 minutes in low flame. Adjust the salt. 11) Open the lid and cook the chicken uncovered for 5 minutes. Add oil in between to avoid burning of the chicken. 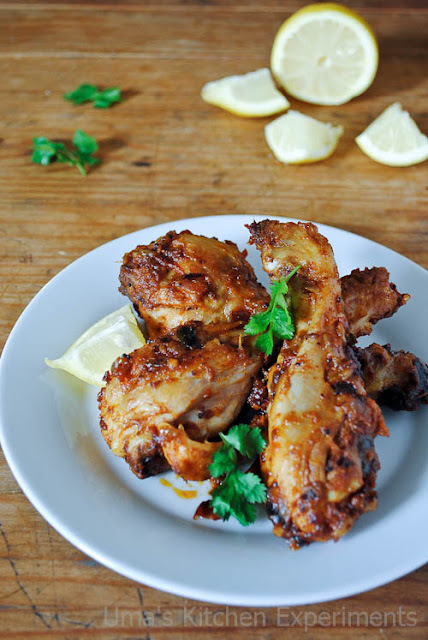 12) Turn the stove off when the chicken drumsticks are completely cooked. 13) Garnish with coriander leaves and serve it hot. 1) Add red chilli powder based on its spicy level. 2) Instead of oil, you can use water to avoid the chicken to become drying. However, you can find the subtle change in taste if you add water. 3) This dry fry gives spicy taste. If you want to reduce it, you can skip adding the dry red chillies while doing the seasoning or reduce the red chilli powder quantity. wow looks so delicious, My family is not a huge fan of legs, maybe once i will try with wings. 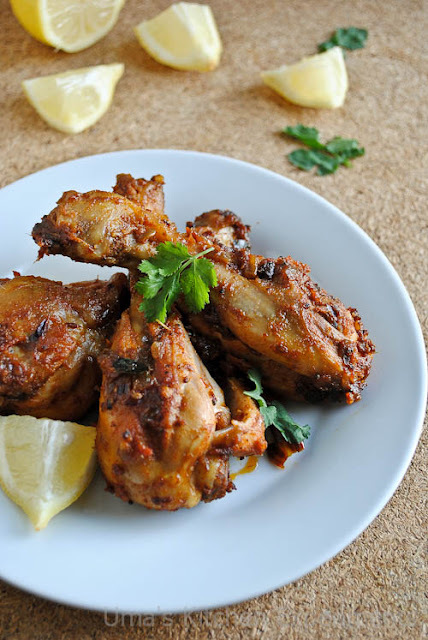 Succulent and super tempting chicken fry. First time here and following you hence forth. @ Misty, You can add more turmeric powder if You wish. If you share where you are staying, based on I can get the cost of it. Drooling here...Looks perfect and yum dear.. I am a beginner.....tried your dish ....it came out very well....am so happy....how do I share the picture?